Family has always been Peggy Turner’s number one priority. Her parents raised her that way, and her mother was a great role model for striking a good work/life balance. 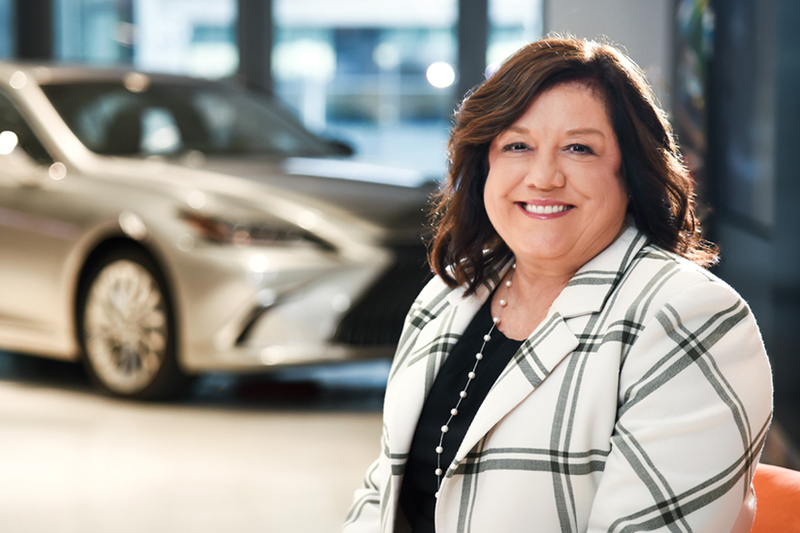 Now, as vice president of Lexus customer satisfaction and owner retention at Toyota Motor North America, she sees that as an essential part of her success. Luckily, Toyota is just the kind of supportive environment that ensures Turner can thrive both at work and at home. She points to one instance in particular where the company supported her while she tried to maintain a positive work/life balance. Years ago, Toyota did not have flexible hours. The company, she says, primarily stuck to an 8:00 a.m. to 4:00 p.m. schedule. However, she was able to negotiate coming in a half hour earlier to also leave a half hour earlier. That way, she could coach her son’s soccer team. When the president of the company scheduled a meeting with her from 4:00 p.m. to 5:00 p.m. on soccer practice day, though, she didn’t know what to do. Today, Turner says that the company’s policies surrounding flexible staffing and supporting work/life have continued to evolve. As she leads the customer experience team for Lexus, she extends that support to her own team. In fact, she says 50 percent of her organization has alternative work schedules. To that end, Turner’s emphasis on family informs the way she approaches ensuring a positive customer experience. Turner says that her team is the voice of their “guests.” Lexus wants to ensure a positive guest experience throughout the entire purchasing journey, from the time customers begin looking to the day they buy a vehicle. That experience continues with Lexus servicing their vehicle and with future vehicle purchases. To accomplish that goal, Turner and her team develop relationship marketing programs and loyalty programs that are personalized and specific to guests, including a variety of communication methods from email and phone to social media. To help her team thrive, she tries to instill values that will help them succeed in not only meeting guest expectations but also exceeding those expectations so they’re beyond happy. Empathy is an important quality, and she encourages the entire team to celebrate surprise and delight. In addition to celebrating surprise and delight, she says trust and empowerment are two principles that are essential to her leadership style. Empowerment means team members don’t have to go to their supervisor for permission to satisfy customers; she makes sure they have the tools to do so. To get there, though, she has to be able to trust her team. So, when she hires, she makes sure each team member has a guest-focused, positive mentality. She describes that mind-set with the Japanese word omotenashi. In continuing to extend that warm hospitality to Lexus guests, Turner is trying to make sure that Lexus’s culture reflects many new markets, such as millennials, women, and multicultural communities. That translates to educating dealers on what these customers expect. For example, women and millennials tend to not enjoy negotiating. So, some Lexus dealers have introduced no-haggle, upfront pricing. Additionally, she says women are sensory and pay attention to details, so one example of what Lexus has done is develop a Lexus Luxury Scent to make the dealership experience more like a resort experience. All of that is extremely important because, Turner says, women are involved with 50 percent of vehicle purchases and influence more than 80 percent of vehicle purchases. Turner says incorporating a diverse array of people to enhance guest satisfaction is not just something the company focuses on for its customers; it’s also a priority for Toyota’s internal culture. And to her, that’s what has made her storied career at the company so fulfilling. Peggy Turner is not only highly engaged at work, but she also has her feet firmly planted in her community. She’s an active member of the company’s Latino business partnering group, Toyota’s Organization for the Development of Latinos (TODOS), which focuses on recruiting, developing, educating, and engaging Hispanic team members. As a former TODOS executive sponsor, she was involved in mentoring, coaching, and sponsoring team members and continues that work today. As a board member at the nonprofit In Roads, Turner has helped countless high school and college students find meaningful internships through their programs by leveraging her networks. Her work at Lexus also touches on innovative ways to provide an experience that’s unique to the changing customer demographic.